Winter is upon us. It’s getting colder by the day and, as the temperatures drop, so does the energy bill rise. There are of course many solutions out there to save on those heating expanses that consist on average 50%-60% of all energy costs for the average home. You can use good R-value insulation, a heat pump, and solar heat storage to minimize your costs. From the array of options to reduce heating expanses, water storage of heat from solar panels, is one of the best in terms of cost effectiveness. The problem however, is the many grey days of winter, and the huge amount of heat loss through water storage systems. But lately, a new solution is emerging from the University of Stuttgart. It’s called Solspaces, and it's promising to give homes buckets of stored heat energy that can dramatically reduce the heating costs. "With the new research building at the University of Stuttgart we have the possibility of realizing a solar heating system with which the heat requirements of a building can be covered throughout the entire year," promised the Head of the Research and Test Centre for Solar Systems at ITM, Dr Harald Drück. It works like this: Whilst everybody is talking about solar energy in terms of electricity, the provision of heat is doomed to a shadowy existence. One reason for this lies in the fact that the heat generated on sunny days needs to be stored for cold periods. Up to now this has been done in water storage tanks requiring a great deal of space. 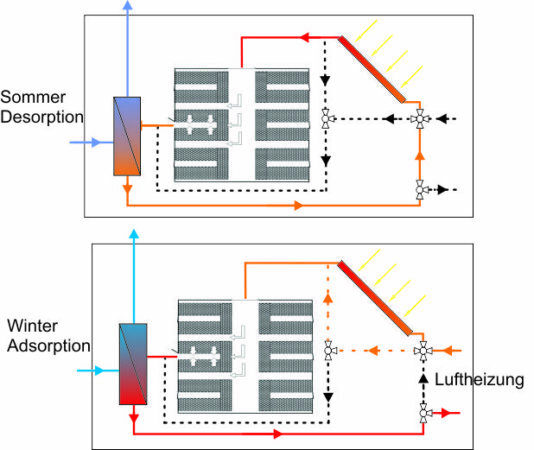 The heating concept pursued in the project "Solspaces", in contrast, is based on a thermal solar system in connection with a sorption heat storage tank. This technology is characterized by energy density three to four times higher than water and enables compact and almost loss-free heat storage. Its centerpiece is a sorption storage tank made of highly porous material called zeolithen. When the zeolithen is perfused with room exhaust and adsorbed in the moisture contained in the air, it creates a process that releases heat. In turn, this heat is used simply to heat the building. In summer the principle reverses: now heat is fed through into the storage tank loaded with moisture in the form of hot air from solar collectors on the roof of the building. The hot air desorbs the storage material. The moisture entered into the storage tank in winter is hereby driven out and removed from the storage tank with the air flow. The storage material dried through this process is thus available again to heat the building. This technique is being implemented these days on a prefabricated house courtesy of SchwörerHaus. All the measurements and tests are due to finish at 2015, and from there move on to production. So perhaps by 2016, we will have a revolutionary heat storage system to warm our winters with extremely low costs.